Based off of a 1938 novel by G.B. 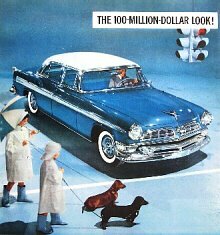 Stern, this classic 1966 Walt Disney movie was directed by Norman Tokar and starred Dean Jones and Suzanne Pleshette. While it didn't win any awards, and lacks the punch of Disney's other classic dog-related movies such as the heart-wrenching drama 'Old Yeller,' this light-hearted timeless comedy continues to entertain kids of all ages. It does a great job of documenting 1960's suburban glamour; the house they live in is amazing. All in all, it's great fun, and if you don't have the movie in your collection, you should! 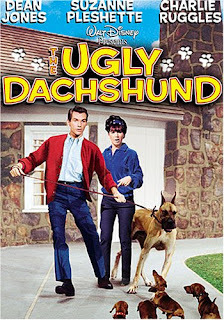 Watch it again today, and enjoy some simple laughs and crazy dachshund hyjinx. It's probably the biggest production of a dachshund-related movie we'll ever see. Read a complete review at Ultimate Disney. It's a favorite time of year for dachshunds and dachshund lovers: Octoberfest time! Surely there's one near you, and we're betting there's dachshund races to boot! 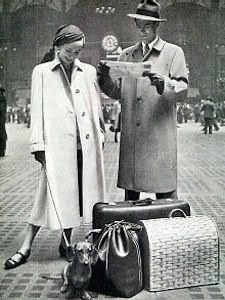 Make sure your doxies are a part of their motherland celebration. 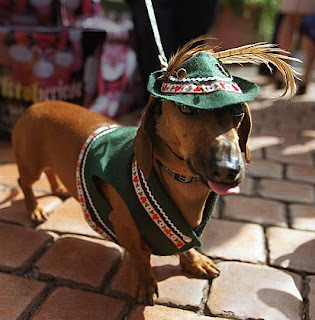 'Gus' is gussied up for the upcoming Oktoberfest in Huntington Beach, California at Old World Village. 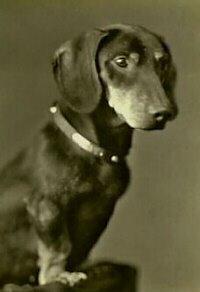 Dachshunds can march in the parade and run in the dachshund races. Woof! If you're interested in the Old World Village Oktoberfest, read more at the OC Register. SESSER -- A Sesser High School student was sent home from class Wednesday morning for wearing what school officials deemed an obscene t-shirt. 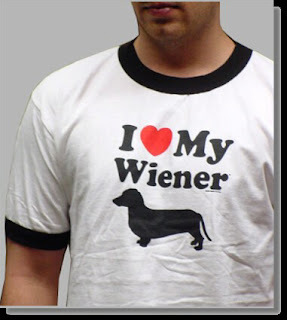 David Clark Jr. was wearing a shirt that read, “I ♥ my wiener.” Below the text was a silhouette of a dachshund, a breed sometimes referred to as a wiener dog. 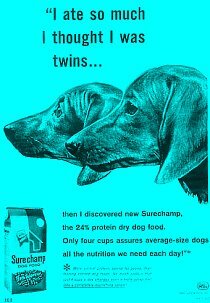 Clark said the shirt was a reference to his pet dacshund (sic), which recently died. Clark said he was asked to turn the shirt inside out, change shirts or leave school. Clark chose to leave class. Clark’s parents, Cathy and David Sr. said they intend to pursue legal action against the school. Listen to Clark and his father at The Southern Illinoisan. Wear your heart on your sleeve. Buy the t-shirt. Meet Allen and Shari Prosser and their five dachshunds: Angel (father), Lady (mother) and their three pups Blacky, Droopy, and Babygirl. A neighbor complained to authorities about the dogs, which exceed the city limit of three dogs. Other neighbors don't seem to mind. Excerpt from The Indy Channel, Muncie, Indiana: They might look too small to be much of a problem, but five pooches represent a pack of trouble for a Muncie family because they have two too many. 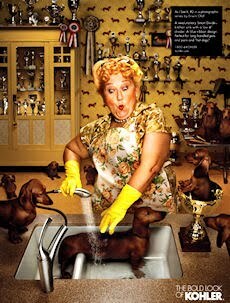 Shari Prosser and her husband, Allen, might have to decide which of their mini dachshunds to keep and which ones to let go. The dogs, with their short legs, long bodies and feisty attitudes, were bred for their ability to chase badgers from their burrows. That's why the wiener dog is also known as the badger dog. Badgered is exactly how the Prossers feel. "They're my kids. They're my family. I don't want to lose them," Shari Prosser said. 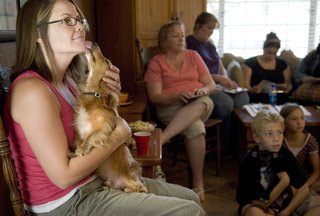 The longtime Muncie residents have grown children and said the dogs keep them company. Two years ago, they lost their grandson, Trenton, to a fire in their home. "They filled the hole when I lost my 2-year-old grandson. I lost animals in the fire and they fill the hole," Prosser said. The Prossers hope to get a zoning variance that would allow them to keep all of the dogs. "I'm going all the way. If I don't win, I'm moving out of state -- sell the house, move south where my daughter lives," Allen Prosser said. "I'm not going to get rid of them." Read more and see a video at The Indie Channel. An emotional Shari Prosser rests her head on her son Donnie’s shoulder after the Delaware-Muncie Metropolitan Board of Zoning Appeals granted a variance allowing Prosser and her husband, Allen, to keep the family of five miniature Dachshunds at their home. 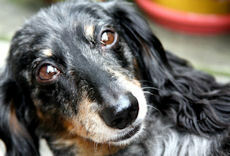 This dachshund tale was recently written in The Star Press out of Indiana by John Carlson. Funny stuff! An interesting thing happened to me last weekend. My wife was leaving for an overnight trip to Illinois, so I decided to walk her out to her car. Anyway, we're on the way out there, her walking directly behind me, when she suddenly says, "Aren't you feeling a little breezy?" And I say, "Breezy? No. Why should I feel breezy?" Then she says, "Because the rear end is totally ripped out of those Bermuda shorts you are wearing." So I turn around and look at her like she is nuts, but she says, "Seriously." So then I reach for my backside and start feeling around for some cloth, but the only thing my hand is coming in contact with is, like, air. Well, naturally, I'm like, "Geez! How'd the rear end get totally ripped out of my Bermudas?" Just then, my eyes land on Layla, our miniature, clothes-hating dachshund, a dog that, take it from me, has dismantled hundreds of assorted shoes, socks, shirts and pants around our place over the last four years. "Layla!!!" I holler, all huffy like, staring hard at her. "Did you rip the rear end out of these Bermuda shorts I'm wearing?" Well, she doesn't reply, but she won't return my eye contact, either, so right then I am thinking dang, she really did it. But then, all of a sudden, I'm thinking something even worse: Uh, didn't I wear these shorts to mow the lawn the day before? Then I'm thinking, yeah, I definitely did wear these shorts to mow the lawn the day before. So, with a look of absolute horror on my face and the rear end of my Bermudas totally ripped out, I mention that sad fact to my wife who, to express her profound sympathy at this disturbing revelation, immediately begins laughing her head off. "Hey," I protest, "it ain't that funny. If I was mowing the lawn with the rear end totally ripped out of my Bermudas, it's only by the grace of God that somebody didn't call the cops!" But what I'm asking myself while my wife is laughing so hard that she is now wheezing from hyperventilation is, what would I have done then? 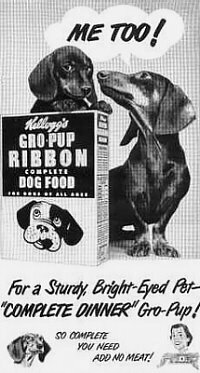 Well, I guess I would have told the cops the truth: "I'm sorry, officer, I didn't realize that my miniature dachshund ripped the rear end out of my Bermudas." Of course, then I think, yeah, like they'd buy that. 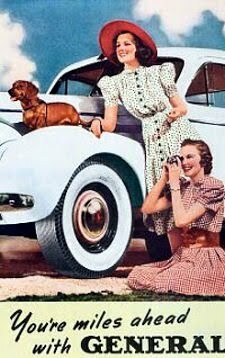 Probably every pervert who gets arrested for exposing himself says something like, "I'm sorry, officer, I didn't realize that my miniature dachshund ripped the rear end out of my Bermudas." So anyway, it was a very lucky thing that none of my neighbors called the cops on me. By the way, if any of them did see me mowing the lawn like that, I want to apologize for both Layla and myself and assure them that, in the future, I intend to check my Bermudas far more carefully before leaving the house. John Carlson is a features writer for The Star Press. Lots of Wiener Races over the weekend! This great photo is from Thursday's "Running of the Wieners" at Fountain Square in downtown Cincinnati, Ohio, as part of a kick-off event for the Oktoberfest-Zinzinnati. See more photos at Fox News. Bella Vista, Arkansas, held their first Annual Wiener Races on Saturday to benefit the Bella Vista Animal Shelter. “ We had wiener dogs all over the place, ” said Tiffany Sparks, a staff member at the Bella Vista Animal Shelter. Read more at The Benton County Daily Record. Over in Toledo, Ohio, nearly 100 dachshunds showed up for the Fourth Annual Wiener Dog Nationals presented by Stautzenberger College and its Vet Tech program. "Wiener dog people are an interesting breed. They are really into their dogs," said Scott Hammer of Stautzenberger College and race commentator. Read more at The Toledo Blade. Toby Vick of Toledo tries to get his dachshund, Charlie, running in the right direction. Who? Joan Blondell (1906 - 1979) was an Oscar-nominated American actress who appeared in more than 100 movie and television productions. This photo is from a session of actors and their pets. 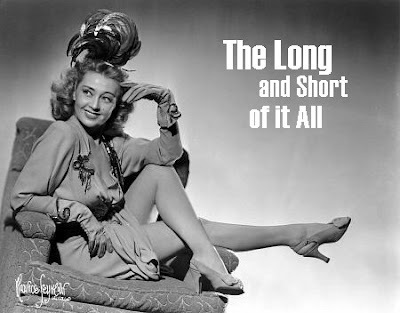 In her fifty year career, Joan Blondell juggled a dual career while acting, dancing and singing; she had a very successful stage career with many appearance on Broadway. Her early acting demeanor was "brassy, wisecracking and happy go lucky," but after leaving Warner Brothers and becoming an independent actress, her roles changed to straight comedy and dramatic. She was born Rose Joan in New York City to Vaudeville players, Eddie and Kathryn Blondell. In early infancy, she slept in a trunk as her parents known as "Blondell and Company" travelled around the world performing in the US, Europe, and the far East. She is the older sister of actress Gloria Blondell, and has a star on the Hollywood Walk of Fame for her contribution to Motion Pictures. 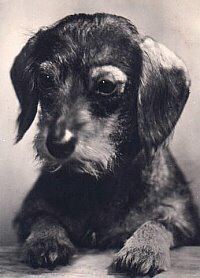 Unfortunately we don't know the names of Joan's smooth black and tan Dachshunds, but if anyone has any more information, by all means leave a comment or send it in! Find out more about Joan Blondell at wikipedia. You can't make this stuff up. Meet beautiful 'Lu Lu' Damitz, a 5-year-old black and tan smooth dachshund and her dashing groom 'Homer' Plants, a 12-year-old toy poodle. The pair decided to finally tie the knot on Saturday after a 5-year courtship. Congratulations to the happy couple! May you have many more years of love and happiness. Excerpt from the Lake County News-Sun: You can't blame Homer for being a little excited Saturday afternoon. He had been waiting for this day for nearly five years. He had to wait just a little longer, until he got the signal to go to the altar and greet his bride-to-be. When word came, Homer wasted little time getting down the aisle, pumping all four of his little legs up the ramp to the altar. Moments later arrived his beautiful bride, Lu Lu. The love of his life. The only dog he'd ever kissed. "They love each other. Lu Lu is his first love," said Carol Plants, Homer's owner. And what better way to honor that love than some doggy nuptials. So on Saturday that's just what they did. 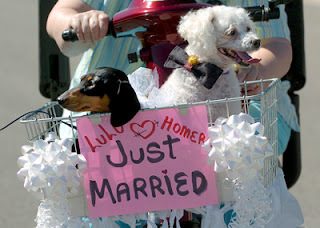 Homer, a 12-year-old toy poodle and Lu Lu, a 5-year-old Dachshund, were married, five years after the pair met as neighbors at Saddlebrook Farms. For the wedding Homer wore a black bow-tie. Lu Lu sported a white veil and her nails were painted metallic purple. The union was love at first sight, said Sherry Emerson, a mutual friend of the dogs who performed the wedding ceremony in front of 30 close friends, including other canines. Lu Lu, the daughter of Ronald and Sharon Damitz, and Homer, the son of Dale and Carol Plants, are next door neighbors at Saddlebrook Farms. The two met while on a walk one day, and they immediately hit it off. "They just had a bond since the day they met. They see each other and they kiss and kiss, so we figured this has to be love," Emerson said. The pair was engaged almost on the spot, and has waited five years to get married. In the meantime, they have played together, and still kiss whenever they see each other. The two even jumped the gun a bit and kissed upon meeting each other at the altar Saturday. And they of course kissed again once they were officially pronounced a couple. When they aren't together, they can be heard barking across Steeplechase Way, where they supposedly communicate while inside different homes. Lu Lu is nearly seven years younger than Homer but is already an expert on marital property. She likes to steal Homer's toys and take them home, said Sharon Damitz. The pair did overcome one obstacle. Lu Lu isn't particularly fond of white dogs, but Homer is the only one she doesn't bark at, Emerson said. Even though they are officially a couple, the two won't be living together. Both are a little too territorial to share their beds, said their owners. There were rumors of allowing them to spend their wedding night together, but that may be too risky, Carol Plants said. Homer is too old to have puppies. The pair will have to settle for adoption. All those other details can be worked out at another time, for Saturday was a day of celebrating. And as the two rode away in the basket of an electric scooter, adorned with a large "just married" sign, they were clearly the center of attention. But will the puppy love last? "It better. We don't do divorces," Sharon Damitz said. The ceremony took place at Saddlebrook Farms subdivision on Saturday with many guests on hand. A hot dog cookout was held afterwards. 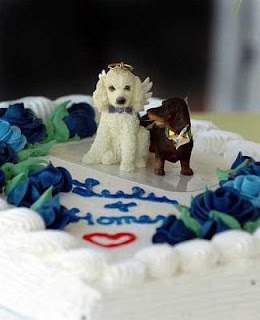 A centerpiece depicting Lu Lu and Homer topped the wedding cake. See more pics at the the Lake County News-Sun. 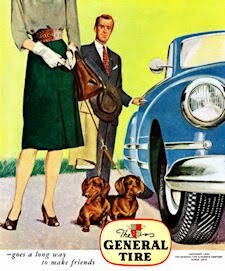 Dachshunds really are everywhere. 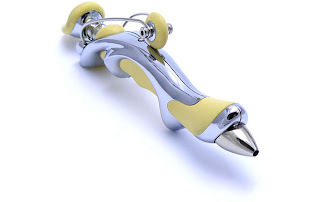 You've probably seen pens with dachshunds on them, how about a futuristic pen that looks like a dachshund? Sleek, stylish, and aerodynamic like a real dachshund, this pen by designer Jean Pierre Lepine is called 'The Free Ride' and will cost you from $150 - $200. As Lepine puts it, "I create tomorrow's writing instruments for today’s men and women." Jean Pierre Lepine, Paris. Turn it around. Still looks like a dachshund. A what? A Pupperware Party! Amy Shafer of east Sacramento gets kisses from her red long-hair dachshund 'Buddy' during a pet party at Citrus Heights, California. 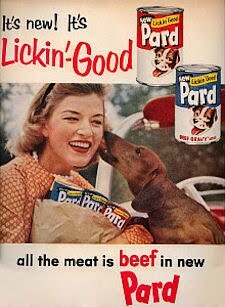 People have long sold cookware and cosmetics in their home, why not leashes, squeaky toys, and doggie breath mints? If you're interested in Pupperware parties, read the rest at The Sacramento Bee. 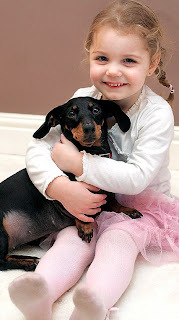 Meet 'Lucy,' the not-so-dangerous black and tan smooth dachshund, and one of her humans, Monique Hobson, aged two. Lucy got loose in October of last year when the family was bringing in groceries from the car and nipped at the ankle of a burly neighbor who pressed charges. Due to a 1991 dangerous dog law, there was a potential fine of £5,000 or 6 months in jail, and Lucy could have been put down. Thankfully, she got a reprieve. 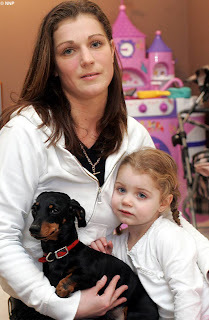 Excerpt from The Daily Mail: An eight-inch-high "sausage dog" was given a reprieve by magistrates today after her owner was cleared of letting a dangerous dog run out of control. Burly landscape gardener Shawn Anderson claimed he was "inconsolable" after miniature Dachshund Lucy allegedly nipped his ankle and bit his jeans. But Newcastle Magistrates' Court heard he suffered no injuries, there were no teeth marks and no damage to his jeans after the yapping dog ran round his legs outside his flat in Gosforth, Newcastle, in October last year. He lived in the property below Lucy's owner, Melanie Hobson, 26, her husband Steve and their two children, Monique, two, and four-year-old Jacob. Magistrates heard that Mrs Hobson was carrying shopping from her car after a trip out with her children when Lucy ran off, barking. 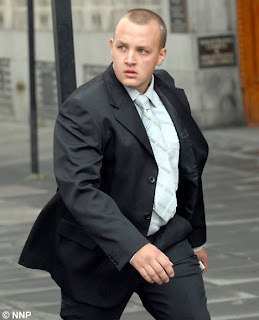 The court heard the dog approached Mr Anderson, ran round his legs and, according to him, bit him on the ankle. One of the two young children ran up and grabbed the dog, the court heard. Mr Anderson then shouted at the owner: "If your dog bites me again, I will have you done." The court heard Mrs Hobson replied: "What are you on about? She didn't touch you." Rochelle Henderson gets kisses from 'Toby,' to thank her for saving his life after he jumped off a backyard pier and became caught underneath it! Way to go Rochelle! Excerpt from the Marin Independent Journal, California: Toby's soggy adventure had a happy ending Monday after the small dog fell off a Belvedere backyard pier and became trapped in the water beneath it. The dog, a year-old black-and-tan dachshund, was pulled out from under the private pier in Belvedere Lagoon about noon by Rochelle Henderson, a nanny next door who volunteered to swim into the lagoon to save the dog after alerting the Marin Humane Society and Belvedere police. Henderson was alerted by another neighbor who swims frequently in the lagoon and saw the dog tumble off the pier - and disappear - during an excited bout of barking, according to Humane Society spokeswoman Sheri Cardo. "She was quite heroic," Belvedere police Officer Andy Rosas said of Henderson. "She grabbed whatever she could find (for swim gear) and did a heck of a job." Dog owner Nancy Freed, who was not at her Windward Way home at the time of the incident, said the dog - adopted from the Marin Humane Society in April - had never before fallen into the water. "He got a little overzealous today," Freed said. Marin Humane Society Officer Andy O Brien keeps an eye on Toby as rescuer Rochelle Henderson swims back to the pier. Peter Almandres looks for a picture as 'Chloe,' his miniature red longhair dachshund, checks out another direction Saturday as they walk along the midway at the Cooper-Young Festival in Memphis. Chloe looks so comfy with her dad! If you're interested in the Midtown Memphis Cooper-Young event, read the rest at commercialappeal. This is a 1931 photo of popular opera singer Richard Tauber and his dachshunds arriving in New York aboard the ocean liner Bremen for his American debut. Richard Tauber (16 May 1891 – 8 January 1948) was an Austrian tenor acclaimed as one of the greatest singers of the 20th century. Some critics commented that "his heart felt every word he sang". Find out more about Richard Tauber at wikipedia, or sit back with a cup of coffee or hot tea this morning and listen to him sing at youtube. We're betting that he sang to his doxies. 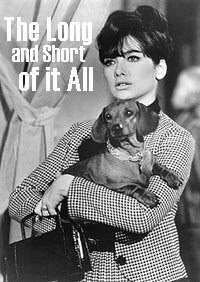 It seems like this dachumentary has been in production for an eternity, but patient dachshund lovers can finally see the World Premier of the film tomorrow at noon at Park Lane Cinemas in Halifax as part of the Atlantic Film Festival. The US Premier follows in a week at the San Francisco Documentary Film Festival, and then heads to BendFilm, in Bend, Ore. Hopefully the film will get picked up by a distributer, get released, and we can all see it soon! Excerpt from the Chronicle Herald: They may have seven-centimetre legs, but they go like lightning in pursuit of their favourite chew toy, running at up to nine metres per second. And when denied their spot in the Wiener’s Circle, the competitors in the Wiener National Championships can fall to pieces. 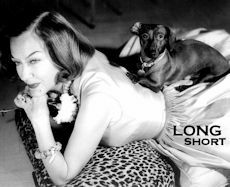 "When Hailey lost, she was so depressed she went limp, her whole demeanour changed," says Shane MacDougall, who chronicled the journey of six racing dachshunds duking it out to be top dog in Wiener Takes All: A Dogumentary. The movie, the first for the Prince Edward Island-born and -raised MacDougall, has its world premiere Sunday at noon at Park Lane Cinemas in Halifax as part of the Atlantic Film Festival. The following week the hour-and-a-half documentary whose tag line boasts it is "a year in the life of the fastest and furriest," makes its U.S. premiere at the San Francisco Documentary Film Festival and then heads to BendFilm, dubbed the new Telluride, in Bend, Ore.
Wiener Takes All is a compelling tale of underdogs and egos, of a world rife with infighting and "racism" where some of the athletes come complete with entourages and racing silks bearing monikers like Pretzel, the Brown Bullet and a controversy that San Diego sports reporter Troy Hirsch said was the biggest he could recall in his community. 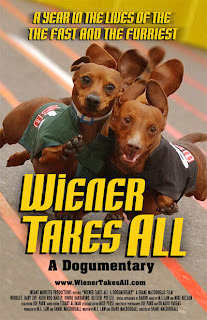 In Wiener Takes All, the characters in the fictional Best In Show mockumentary become real. One industry veteran says people will spend up to $100,000 a year to get their pooch to the top of the competitive dog show circuit. The winner of the national championship gets a parade, and there’s even a "muttrimonial" performed by a licensed minister, complete with a dog bone-decorated multi-tiered cake, tuxedo and veils. 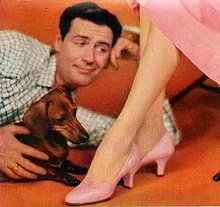 But mostly, says MacDougall, who lives in San Diego with his wife and four cats, Wiener Takes All is about the heart of the darling dachsies. Read the rest. For more info, here's the official Wiener Takes All website. Sit back with your doxies and relax on this cool dachshund bench. Gotta get on the next plane to Toronto for this fun photo op! Make sure to check out all of Georgie_grrl's great photos of Toronto right here on flickr. 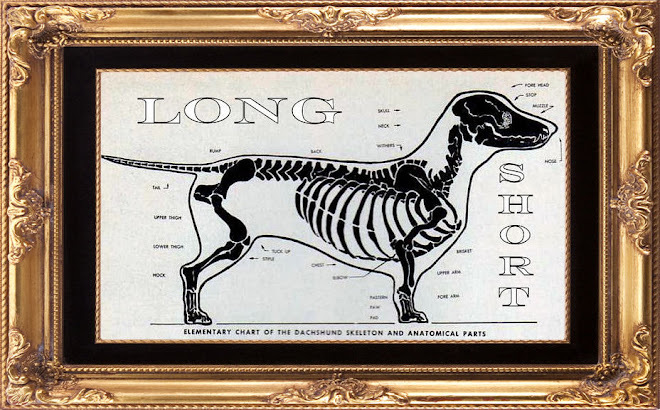 How great would it be to find this original 1905 dachshund poster advertising a dog exhibit? Reproductions are available from $15 for a poster to $300 for a fine lithograph. The artist, Georg Belwe, born 12.8.1878 in Berlin, Germany, died 1954 in Ronneburg, Germany, was a typographer, type designer, and teacher who studied at the Königliches Kunstgewerbemuseum in Berlin. Find out more about Georg Belwe at linotype.com. ‘Java’ the dachshund attacks the trash can when his humans went out one night. Funny stuff! It's a little long, but Java gives the trash can a good pounding at about 5:40 on the clock on the screen. That's one determined dachshund! Meet 'Duncan!' 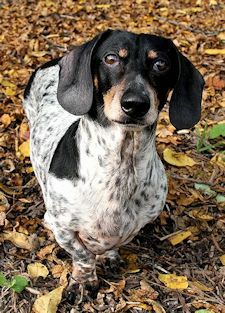 Duncan is an 11-year-old chocolate and tan dappled dachshund. Duncan placed first in the costume contest on Sunday at the 4th Annual Wienerfest in Belfast, Maine. 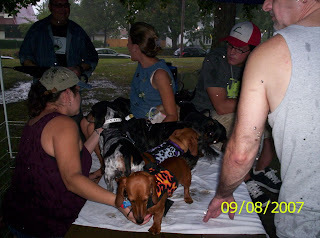 Like the Midwest Dachshund Festival in Danville, Illinois on Saturday, the event was hampered with rain, but there were over 400 dog owners last year. 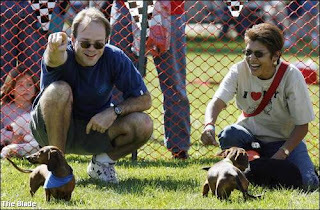 The Wienerfest also featured dachshund races and vendors. Excerpt from mainecoastnow: Duncan “Cowboy” Gallant stood in front of them all in his cowboy hat, neckerchief, serape and boots as the crowd shouted his nickname. “Cowboy!”The 11-year-old dachshund won the best costume award at the 4th annual Wienerfest on Sunday, one of more than 140 of the long-bodied, short-legged canines that are sometimes called “hotdogs” to enter the festival at Steamboat Landing and the Boathouse. It wasn’t the first taste of victory for Duncan, a chocolate dappled dachshund whose owners Donald and Judy Gallant live in Frankfort. Their pet won the best costume event the first year of Weinerfest with a Snoopy pilot’s outfit reminiscent of the Charlie Brown comic strip. The second year, he took second as Count Duncan, dressing up as Dracula. Last year he wore an army outfit with a tiny M-16 rifle strapped to his back and won first prize. He took his latest victory with doggie aplomb, looking around at the other pets and their owners, without barking or acting up. Read the rest. Alex Allenwood of North Searsport heads Midge in the right direction for the race. Thatcher of Skowhegan transforms into the Tin Man. Images courtesy Waldo County Citizen. See more photos from the event. Hundreds of dachshunds and friends descended on Danville, Illinois on Saturday for the 11th Annual Midwest Dachshund Festival. It rained and rained and rained. Your 'Long and Short of it All' hosts, Joey and Maggie, can attest to the downpour, the first time it rained at the event in 11 years. All things considered, the doxies still had a great time. 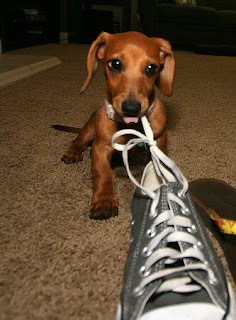 Photos courtesy Chicago Dachshund Lovers. Excerpt from Commercial-News: Hundreds of little legs ran as fast as they could Saturday as a drizzle turned into a downpour at Lincoln Park. The annual Midwest Dachshund Festival moved into the park’s pavilion, but many of the pint-sized participants and their parents packed up and headed for home. The annual event seeks to publicize the plight of abandoned dachsies. Previously called Dachsiefest and held at Kickapoo State Park until this year, more than 300 dogs and their owners were expected to attend. But as with any outdoor event, weather plays an important role. This year, Mother Nature cut the festivities short, as short as the little dogs’ legs. Neil Cortus served as the event’s emcee. He said as soon as the lightning started, he had to shut down all his electrical equipment and cover it up. “It’s been a tough one today,” Cortus said, as he and his wife loaded their nine dachshunds and all their supplies into their camper. 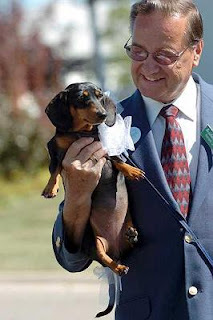 Those events included contests for: the farthest travel to the festival — dog and owner from Washington state; most dachsies brought to the event — 13; oldest dog — 20-years-old; and everyone’s favorite, the costume parade. Although Jill Blasdel-Cortus, president and founder of Dachshund Rescue of North America, felt disappointed that the weather interfered with the event her group sponsored, she and her husband Neil remained optimistic. “We spoke with the mayor (Scott Eisenhauer) right before things got really bad,” Neil Cortus said. “He said he’ll help us find an indoor venue for next year.” Read the rest. 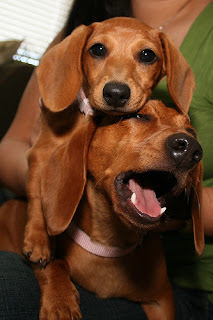 More information on dachshund rescue and an event calendar for Dachshund Rescue of North America can be found at DRNA. Meet 'Mr. Weenie!' 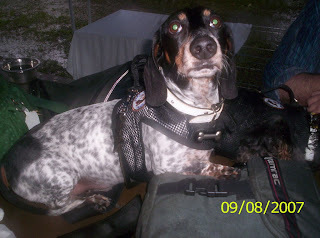 Mr. Weenie, a black and tan smooth dachshund, was a character in the 2006 Sony Pictures animated film 'Open Season.' If Mr. Weenie doesn't look so happy, that's because he's just found out that he's going to be the star in the sequel 'Open Season 2,' but it's going to go directly to DVD. Excerpt from The Animation Blog: Sony Pictures Animation has confirmed that it’s making a direct-to-DVD Open Season sequel which will hit store shelves in 2009. The original film took in $190 million worldwide and performed well on DVD so a sequel isn’t much a surprise. What is a surprise is the decision to go straight to DVD which hopefully doesn’t mean the production value will suffer. The new movie will focus on Mr. Weenie and Giselle, both of which were characters in the original film. No word on whether or not the Elliot and Boog characters (Ashton Kutcher and Martin Lawrence) will make an appearance. Find out more about 'Open Season' and Mr. Weenie at wikipedia. If you live in the Midwest, don't miss the 11th Annual Midwest Dachshund Festival tomorrow, September 8th, 2007 in Danville, Illinois. The event is now organized by Dachshund Rescue of North America, and over 300 dachshunds are expected! There will be vendors, wiener races, costume contests, dachshunds on parade, and lots of other fun contests. Find out more at the DRNA website. Your 'Long and Short of it All' hosts, Joey and Maggie, will be there. Stop by and say hello at the Chicago Dachshund Lovers tent! Woof! 'Duke,' a black and tan longhair dachshund, gets bandaged after veterinarian Christi Kresser removed a catheter at the Animal Hospital of Padre Island. This is the only animal hospital on Padre Island, where residents prefer not to cross the bridge to the mainland if they can avoid it. We're betting that Duke enjoys the weather there! Find out more about the animal hospital at the Caller-Times link. Meet 'Angus' and his 10-year-old human Robbie Breece. Angus is a black and tan wire-haired dachshund. They're gearing up for the Carmichael Founder's Day dog show on September 15th in Carmichael, California. Last year they won contests in 3 categories! Way to go Angus and Robbie! Excerpt from the Sacramento Bee: After winning last year in three categories, including eating the most hot dogs, 10-year-old Robbie Breece is pretty sure he and his dog, Angus, are going to win again in this year's Carmichael Founder's Day dog show. "After the last show, I taught him a new trick," the fifth-grader said. "I say 'sit pretty' and I hold the granola bar above his nose, and he sits for a really, really long time," the Fair Oaks boy said. "I like winning," Robbie said as his wire hair dachshund waddled next to him, sniffing his hands for a treat. Robbie also won a trophy and a ribbon for having the dog with the tail that wagged the most and was the most poised. "Basically, he just pranced around in a circle," Robbie said of Angus, who was named more for his color than his bullish characteristics. Read more about the event. Meet 'Spud!' Spud is a pretty 3-year-old red longhair dachshund who knows how to keep cool in these dog days of summer by seeking shade in the grass, or a tile floor under a fan in the house. Excerpt from the Bradenton Herald, Florida: Spud the dachshund wasn't lying in a bun or under a scoop of sauerkraut, but his relentless search for shade in the midmorning heat indicated he was one hot dog. Spud's smart, said his owner, Stephanie Chan, as she walked him down the sidewalk along Meandering Way in Summerfield. Though he's an inside dog, the 3-year-old Spud loves the outdoors and knows how to keep cool on his walks throughout the day. If he gets hot, he lies in the grass for a while to cool off. Chan takes the proper precautions, too. She usually walks him along the lake behind the family's home, where there's ample shade, and she carries a bottle of water in case Spud starts panting. It's better to be safe than sorry, and during these dog days of summer, it's not only the females that need to worry about being in heat. See 2 more photos of Spud and read more about canine heatstroke at the Bradenton Herald link. 'Flirt,' a long-haired miniature black and tan dachshund, tugs on her leash in the arms of her owner, Lindsey Pabst, after placing first at the Kenai Kennel Club's dog agility trial Sunday in Alaska. At 13-years-old Lindsey was the youngest handler, running the agility course with the smallest dog at the trial. Way to go Flirt and Lindsey! Excerpt from the Peninsula Clarion: Lindsey Pabst is no stranger to the world of dog agility. After watching her mother train dogs ever since she could remember, it probably isn't surprising for those who know her to find 13-year-old Lindsey standing in line with Flirt, her 5-year-old long-haired miniature dachshund, at the Kenai Kennel Club agility trial Sunday awaiting her chance to take on the jumps and weaves. "My goal is to run really fast to get her moving and keep her happy, excited and motivated," Lindsey said. "Sometimes she's off and doesn't want to do anything." Lindsey was 8 when she met Flirt, and started training her when the dog was 6 months old. At her first trial, Lindsey's goal was to just have fun, but after approximately three years of trials, Lindsey hopes Flirt will get a title in the jumping course and the standard course which includes all the obstacles before the event is over. Read the rest. The address is Party Cove, Perry Lake, Kansas. Watercraft are tied together, and passengers jump from boat to boat, visiting friends and sometimes strangers. Looks like 'Baxter' is enjoying his holiday! Excerpt from the Lawrence Journal: Melissa Sparks, of Topeka, floats on a raft in the cove with her miniature dachshund, Baxter. About 60 watercraft were anchored in the cove Monday. If you're interested in Party Cove at Perry Lake, read the rest. It was the opening of dove season in the Central and North zones on Saturday, and 'Stretch' the dachshund went to work in Texas. Excerpt from the Tyler Morning Telegraph: An unusual hunt calls for an unusual retriever, and Stretch, a young Dachshund owned by Stephen Wilson of Brownwood, filled the bill Saturday. If you're interested in dove hunting, read the rest.